My students consistently struggle to make complete sentences. 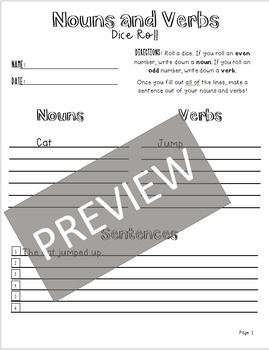 This activity guides students through selecting nouns and verbs, using those nouns and verbs to make sentences, then to adding adjectives and adverbs to make "fancy sentences"! My students always know when I say they need a fancy sentence, they need to have a sentence with a strong noun, verb, adjective and adverb! Your students do need access to a die for this activity. You can usually get large foam dice from the Dollar Tree. If needed, I've also included the template for a large printable die. You would need paper, a printer, glue or tape to make this!